Give your youngster a stellar master-building experience with THE LEGO MOVIE 2 70821 Emmet and Benny’s ‘Build and Fix’ Workshop! This LEGO 4+ safe learning building set is specially designed to be fun and easy for preschoolers and youngsters. 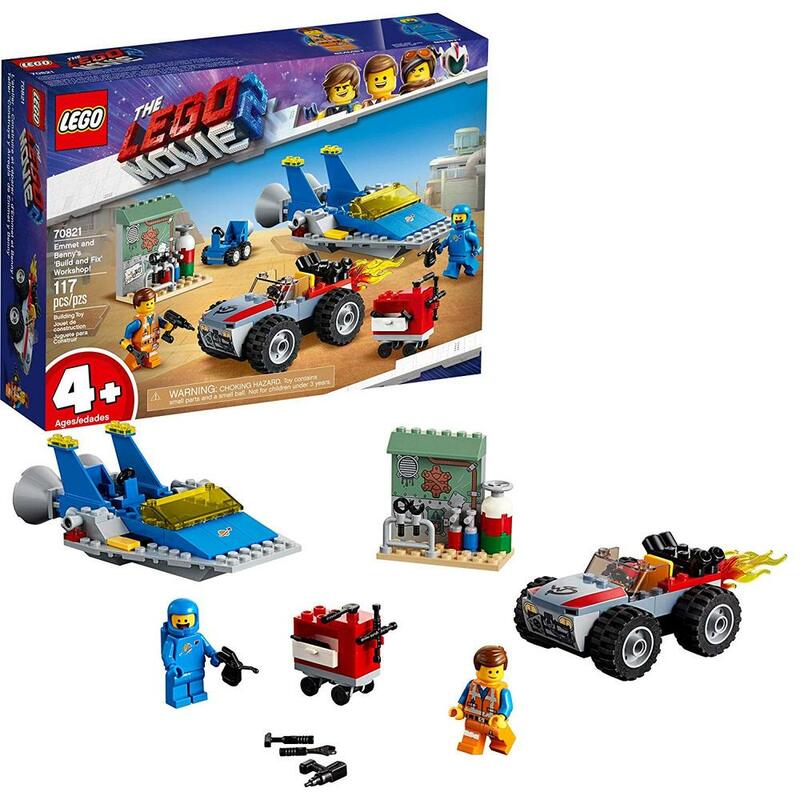 It features 2 toy vehicles—LEGO Benny’s Spaceship with a minifigure cockpit, foldout boosters and removable space buggy, and Emmet’s Escape Buggy—plus a special Starter Brick base that lets even first-time builders experience the pride of constructing buildings, vehicles and more, all on their own. The included simple guide to build and play will also help your young master builder understand the purpose of the building instructions and expand their imagination and confidence for the perfect start to LEGO brick building. This simple LEGO building toy includes 2 THE LEGO MOVIE 2 minifigures, a buildable gas station and a tool trolley with lots of assorted tool elements for endless play possibilities. Plus Benny’s helmet and air tank elements.